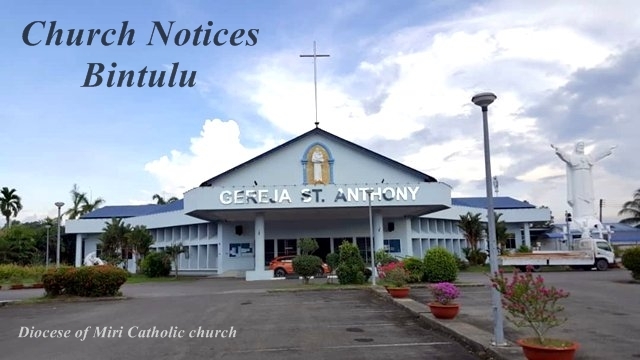 FIAT and Bintulu Young Catholic Students (BYCS) are jointly organizing an Easter Camp at the end of March for students aged 13 – 18. Registration forms and details are available after Mass today. Participation is limited to 170 persons only. Next Sunday, 25th March is PALM SUNDAY. Masses will be as usual. Parishioners are reminded to bring their own palm leaves for blessing. As part of our observation of Lent, the Parish is inviting everyone to the 24 HOURS FOR THE LORD session at the Parish Hall next Friday. Next week is Holy Week. The times for Masses and Good Friday service are on display on the Notice Board. Parishioners are reminded to bring their own candles for Holy Saturday. We require a lot of flowers for Easter. Do be generous. Parishioners who already have the envelopes are urged to return their donations by 15th April. They can drop the envelopes into the collection bags on Sunday. If you still do not have an envelope, do get one from the wardens. Help the poor. There will be no daily Mass on 21st and 22nd (Wednesday and Thursday).